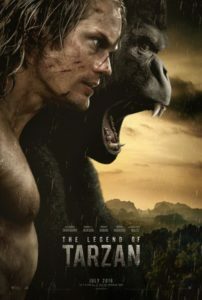 I spent a good twenty minutes wondering if The Legend of Tarzan was a sequel to a film that somehow slipped by me. After a bland preamble yet again establishing scummy white guys as the enemy of the republic of Congo, we zip to London to find Tarzan as… no longer Tarzan. “But I’m not Tarzan any more!”, no-longer-Tarzan (Alexander Skarsgard) says something like to someone that might have been Jane (Margot Robbie) – because she’s there too. Wait what did I miss? He’s already Tarzan? She’s still Jane of course, but they’ve already done the whole “me Tarzan, you Jane” bit? So what’s left then? And what Alexander Skarsgard’s Tarzan can do is control computer generated creatures. He can converse with gorillas, cuddle wild lions, and you can bet he can chat up an alligator at short notice. Not a typo. He can also conjure a strategically placed vine from anywhere and engage in unremarkable action sequences that elicit no emotional response. Unlike the Congo this film doesn’t appreciate its natural resources. It lets Margot Robbie stew in a cage for half the film. It lets Christoph Waltz set up a character with no real pay off. It allows Sam Jackson to get paid to be an onscreen narrator, and most of all it lets young Skarsgard and his chiseled abs be outshone by frankly generic and forgettable cgi animals. Actually ‘Most of All’ it opts to mislabel what is a formulaic tale instead of tackling the actual Legend known worldwide. Final Rating – 5.5 / 10. Me Tarzan, Who Cares?